As the fall 2016 orientation week came to a close, first-year students within Lazaridis School of Business & Economics were invited to attend O-Day, an annual one-day event planned and facilitated by the Lazaridis Students’ Society. O-Day is an exclusive orientation event for incoming Business and Economics students to provide them with key information, connections and resources to help them excel in their first year and the subsequent years ahead. With over 700 first-year students in attendance on Sept. 11, this marked the Lazaridis Students’ Society’s largest event in its history! First-year students spent the morning on Laurier’s Waterloo campus meeting with upper year mentors who volunteered their time to answer questions, offer insight and support the latest incoming Lazaridis School students. 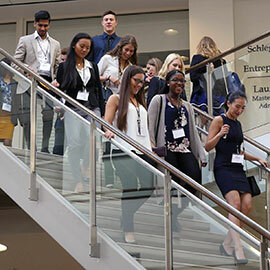 These morning sessions provided the class of 2020 with information they could carry throughout their years at the Lazaridis School: in-depth details about co-op, designations, specializations, life at Laurier and semesters abroad, amongst others. O-Day 2016 then transitioned to Bingemans for the remainder of the day. During lunch, members of the Lazaridis Students’ Society executive team spoke about their plans for the forthcoming year, unveiling two new initiatives: the official LazSoc app and the Student Discount Program. Mike Hamilton, vice president of RBC Insurance and the O-Day 2016 keynote speaker, shared his inspiring journey through the military and into the corporate world. Attendees then enjoyed afternoon sessions organized by two of the event’s sponsors, Awake Chocolate and RW&CO. To conclude the day, the 22 clubs and associations within the Lazaridis Students’ Society set up booths for first-year students to network and learn about getting involved in the campus community.